Trayvon Reed and Texas Southern got busy in Eugene, beating 18th-ranked Oregon on its home floor. Upsetting one Power Five school in a year is awesome for an HBCU. Beating two, including a nationally ranked one, is monumental. 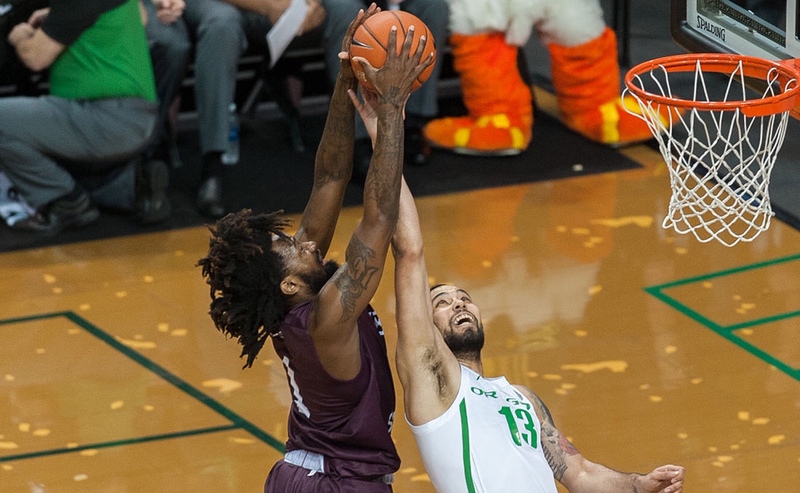 Texas Southern did just that on Monday night, beating 18th ranked Oregon 89-84 on the road in one of the biggest upsets in college hoops so far. The SWAC school was a 24-point underdog to its PAC-12 hosts. No. 18 Oregon just lost to Texas Southern as a 24-point favorite. The Pac-12 could very well be a one-bid league this season. The start to the college basketball season has been a disaster for this conference. Big man Trayvon Reed led the way with 23 points for the Tigers, including four big dunks inside. He was a perfect nine-for-nine on field goal attempts. John Jones, son of coach Johnny Jones, added 20 points off the bench. Jayln Patterson did it all, putting up 13 points and 11 assists in the win. Ironically, our Dominique Monday pegged Monday night’s game as a possible upset for Texas Southern when the schedule came out. Just saying. The win comes just weeks after Texas Southern pulled off a win over in-state rival Baylor to tip off the season. It’s a remarkable feat for the two-time defending SWAC Champs, who have undergone tremendous change since last season. It is playing this year under a new coach in Jones and has had to replace last season’s leading scorer in Trae Jefferson. TxSO has played a brutal non-conference schedule for the last several years under Mike Davis. While it never resulted in a big number of wins, it appears to have battle tested the program. Couple that in with Jones’ outside background and the talented transfer who also came from LSU, TxSO is playing like a team hoping to avoid a no. 16 seed should it win the SWAC.